A key part of creating a whole-school approach to mental health in your school is ensuring supportive mechanisms are in place for staff as much as for pupils. Stigma around mental health for teaching staff can centre on feeling unable to speak openly about how you are feeling on a daily basis, especially when you are struggling. Too often staff with mental health problems feel they cannot talk openly about mental health with fellow teaching staff or school leaders out of shame or fear of being judged. We know teachers are under a lot of strain. In a survey by Nasuwt teaching union, 83% respondents reported workplace stress. Teaching is among the ‘three most stressed occupations’, according to research by a University of Manchester academic, quoted in the Times Educational Supplement. Speaking openly about mental health benefits us all. It is vital that teachers not only look after the wellbeing of their pupils, but their own wellbeing too. At Time to Change we liken it to the ‘oxygen mask principle’ where adults take care of their own needs first so they can then help others. Create a culture of openness: Regular one-to-one meetings and catch-ups are a great way to ask your staff how they’re getting on to build trust and give employees a chance to raise problems at an early stage. Encourage mental health ‘champions’: People at all levels talking openly about mental health sends a clear message that you will get support if you’re experiencing a mental health problem and that it is not a barrier to career development, thereby reducing stigma. Embed mental health in induction and training: Ensure staff are given information about what mental health support is available as part of their induction. Putting mental health awareness training into practice can also help. Create a ‘buddy’ system: Buddy systems build and strengthen relationships between colleagues and provide a way to chat about wellbeing and challenges in an informal setting. Raise people’s awareness of building resilience and supporting wellbeing: You can do this by making the most of internal communications channels, such as posters, notice boards, staff newsletters, and intranet pages to provide information on maintaining a healthy work-life balance. Mike Walters, Headteacher at St Anselm’s Catholic School in Kent, has taken various steps to support the wellbeing of his staff. In order to get feedback and speak openly, he has an advisory group that meets regularly with him to share any concerns or ideas. The school is currently running a wellbeing programme which consists of a series of six Continuing Professional Development (CPD) courses that run across the year, specifically aimed at staff mental wellbeing that include: vicarious trauma; stress; neuro-linguistic programming to foster a positive mind-set; using coaching to maintain staff wellbeing by understanding and developing your communication; emotional resilience; and understanding and addressing your own mental health and wellbeing. Staff are either instructed to attend or the sessions are optional; these are not just for teaching staff but any staff member that belongs to the school. This ensures that the whole teaching and support staff community can access these services. In-house support: what wellbeing support is available at work? We are Time to Change, a growing movement of people changing how we all think and act about mental health problems. Our voice is stronger and louder thanks to funding from the Department of Health, Comic Relief and the Big Lottery Fund. Our campaign is run by Mind and Rethink Mental Illness, and thousands more organisations have joined us to make change happen. Your work is ensuring that this generation can be more open about mental health problems than any generation before. 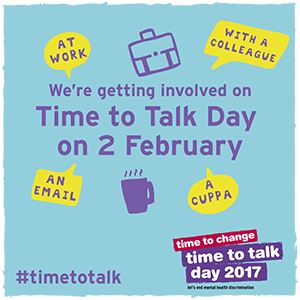 You can help spread the word of Time To Talk Day by getting involved on social media. Find out more here. Follow Time to Change on Twitter. Find Time to Change on Facebook.